Sharing some kitchen inspiration today. Serious #kitchenenvy after seeing this sparkly white kitchen from Sara Ray Interior Design. Every detail is clean and makes this kitchen feel 10 times bigger than it may actually be…the white subway tiles with the silver range and the glass panels on the upper cabinet doors and the amazing milky white pendant light fixtures over the island, and that’s just at eye level! Then you look down and realize there’s this fabulous blue vintage rug and grey upholstered bar stools with some rich chocolate wood floors that complete the room. Off to the side of the kitchen is this great little butler’s pantry that has an AMAZING herringbone backsplash and the grey cabinets on both top and bottom, the details here really set this space apart from the main kitchen. What do you think? Like or Love this kitchen?? Oh AND I have a winner for the #BEHRBox Giveaway!!! It was so fun seeing all of the great DIY projects you sent in! The winner of the #BEHRBox Giveaway is Ashley Fiocco! Thank you all for submitting comments – look for another holiday giveaway very soon! Loving this butler’s pantry and the way it’s set apart from the rest of the kitchen design. 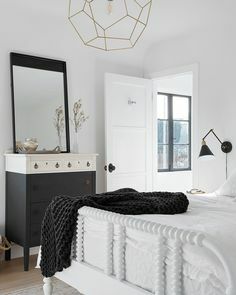 Where can I buy the herringbone backsplash?